Solid is a value-engineered floor with an uncomplicated visual. 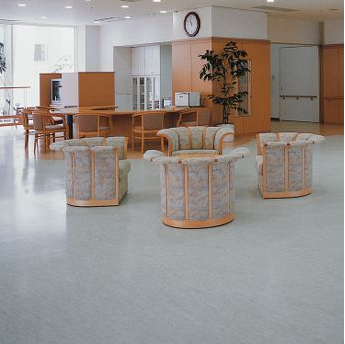 This floor is for areas requiring economical homogeneous performance. Styled for healthcare, education, hotels, retails and office interiors. PUR surface reduces ongoing maintenance and scuff-mark resistance. Heat welding blocks dirt and moisture penetration for clean, aseptic seams. Simple, uncomplicated visual in 16 colors. Applications: education, healthcare, light industrial and office interiors. Advance Engineering & Supply Co. Founded in the year 1966, started as a partnership firm dealing with products related to interior & exterior of building materials. In the past 48 years, we have provided time bound and realistic solutions to numerous challenges arising out of the construction sector. With our rich experience and expertise knowledge, we continue to provide with the best solutions available. Presently we are dealing with sound acoustic materials, construction chemicals, Wooden/ Laminated/ Vinyl flooring and height solutions. Besides, we also carry out fabrication, erection of false ceiling, aluminium/ UPVC doors and windows along with partitions too. We are the proud distributors of M/S Armstrong World Industries (India) Pvt. Ltd., Youngman, Prayag, Saint Gobain, Sika & Dr. Fixit.